A bas relief at the twelfth century temple of Angkor Wat in Cambodia. An Apsara (Sanskrit: अप्सरा: apsarāḥ, plural अप्सरस: apsarasaḥ) is a female spirit of the clouds and waters in Hindu and Buddhist mythology. English translations of the word are "nymph," "celestial nymph," and "celestial maiden." Apsaras are supernatural beings who appear as young women of great beauty and elegance that are proficient in the art of dancing. They are the wives of the Gandharvas, court servants of Indra. They dance to the music made by their husbands, usually in the palaces of the gods, and entertain gods and fallen heroes. In their assignment as caretakers of fallen heroes, they may be compared to the valkyries of Norse mythology. Apsaras are said to be able to change their shapes at will, and specially rule over the fortunes of gaming and gambling. Urvasi, Menaka, Rambha, and Tilottama are the most famous among them. Apsaras are sometimes compared to the muses of ancient Greece, with each of the 26 Apsaras at Indra's court representing a distinct aspect of the performing arts. Apsaras are associated with water; thus, they may be compared to the nymphs, dryads, and naiads of ancient Greece. They are also associated with fertility rites. In Hinduism, the lower Apsaras are sometimes regarded as nature spirits who may lure men to their deaths; in this respect they may be compared to the Slavic Rusalki or the Greek sirens. The golden apsara in Majapahit style, Java, Indonesia. In Javanese tradition, the apsaras live in Indra's heaven, and are known to seduce ascetics. The Rig Veda tells of an Apsara who is the wife of Gandharva; however, the Rig Veda also seems to allow for the existence of more than one Apsara. The only Apsara specifically named is Urvashi. An entire hymn deals with the colloqy between Urvashi and her mortal lover Pururavas. Later Hindu scriptures allow for the existence of numerous Apsaras, who act as the handmaidens of Indra or as dancers at his celestial court. Ghritachi and Menaka and Rambha and Purvachitti and Swayamprabha and Urvashi and Misrakeshi and Dandagauri and Varuthini and Gopali and Sahajanya and Kumbhayoni and Prajagara and Chitrasena and Chitralekha and Saha and Madhuraswana, these and others by thousands, possessed of eyes like lotus leaves, who were employed in enticing the hearts of persons practising rigid austerities, danced there. And possessing slim waists and fair large hips, they began to perform various evolutions, shaking their deep bosoms, and casting their glances around, and exhibiting other attractive attitude capable of stealing the hearts and resolutions and minds of the spectators. The Mahabharata also documents the exploits of individual Apsaras, such as Tilottama, who rescued the world from the rampaging asura brothers Sunda and Upasunda, and Urvashi, who attempted to seduce the hero, Arjuna. A common theme appearing in the Mahabharata is that of an Apsara sent to distract a sage or spiritual master from his ascetic practices. One story embodying this theme is that recounted by a woman named Sakuntala to explain her own parentage. It states that the sage Viswamitra generated such intense energy by means of his asceticism that Indra himself became fearful. Deciding that the sage would have to be distracted from his penances, he sent the Apsara Menaka to work her charms. Menaka trembled at the thought of angering such a powerful ascetic, but she obeyed the god's order. As she approached Viswamitra, the wind god, Vayu, tore away her garments. Seeing her, thus, disrobed, the sage abandoned himself to lust. Nymph and sage sported together for some time, during which Viswamitra's asceticism was put on hold. As a consequence, Menaka gave birth to a daughter, whom she abandoned on the banks of a river. That daughter was Sakuntala herself, the narrator of the story. Natya Shastra, the principle work of dramatic theory for Sanskrit drama, lists the following apsaras: Manjukesi, Sukesi, Misrakesi, Sulochana, Saudamini, Devadatta, Devasena, Manorama, Sudati, Sundari, Vigagdha, Vividha, Budha, Sumala, Santati, Sunanda, Sumukhi, Magadhi, Arjuni, Sarala, Kerala, Dhrti, Nanda, Supuskala, Supuspamala, and Kalabha. The Apsara of Borobudur, the flying celestial maiden depicted in bas-relief of eighth century Borobudur temple, Java, Indonesia. Images of Apsaras are found in several temples of ancient Java dating from the era of the Sailendra dynasty to that of the Majapahit empire. Usually they are not depicted as decorative motifs but as integral parts of a story in bas-relief, as for example at Borobudur, Mendut, Prambanan, Plaosan, and Penataran. At Borobudur apsaras are depicted as divinely beautiful celestial maidens, pictured either in standing or in flying positions, usually holding lotus blossoms, spreading flower petals, or waving celestial clothes as if they were wings enabling them to fly. The temple of Mendut near Borobudur depicted groups of devatas, divine beings flying in heaven, which included apsaras. Traditionally, apsaras are described as celestial maidens living in Indra's heaven (Kaéndran). They are well known for their special task: Being sent to earth by Indra to seduce ascetics who, by their severe practices, may become more powerful than the gods. This theme occurs frequently in Javanese traditions, including the "Kakawin Arjunawiwaha," written by mpu Kanwa in 1030 C.E. during the reign of king Airlangga. The story tells that Arjuna, in order to defeat the giant Niwatakawaca, engaged in meditation and asceticism, whereupon Indra sent apsaras to seduce him. Arjuna, however, managed to conquer his lust and then to win the ultimate weapons from the gods to defeat the giant. The Javanese Hindu-Buddhist tradition also influenced Bali. In Balinese dance, the theme of celestial maidens often occurred. Dances such as Sanghyang Dedari and Legong depicted divine maidens in their own way. In the court of Mataram Sultanate, the tradition of depicting heavenly maidens in dances was still alive and well. 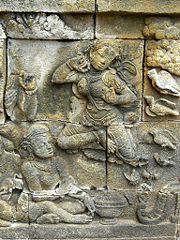 The Javanese court dances of Bedhaya also portray apsaras. Two Apsaras dance on a stone pillar in the 12th century temple called the Bayon at Angkor in Cambodia. 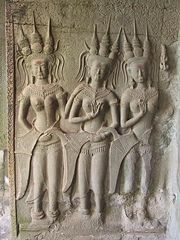 Apsaras represent an important motif in the stone bas-reliefs of the Angkorian temples in Cambodia. Descriptions of the temples often distinguish between two types of depictions of female celestials: depictions of figures who are dancing or are poised to dance, which are called "Apsaras;" and depictions of figures who are standing still, facing forward, in the manner of temple guardians or custodians, which are called "Devatas." “The devatas seem to epitomize all the elements of a refined elegance,” wrote Marchal. Carved apsaras are particularly common at Angkor Wat, the largest of the ancient Angkorian temples. Scholars have counted more than 1,860 at the twelfth Century monument, some carved on pillars, some on walls, some high up on towers. A study published, in 1927, by Sappho Marchal cataloged remarkable diversity of hair, headdresses, garments, stance, jewelry, and decorative flowers, which Marchal concluded were based on real-life practices of the Angkor period. Some apsaras appear with arms around each other and seem to be greeting the viewer. Artists in Khmer Classical Dance perform in January 2007 in Siem Reap. Khmer classical dance, the indigenous ballet-like performance art of Cambodia, is frequently called "apsara dance." This appellation reflects the belief that the Khmer classical dance of today is connected by an unbroken tradition to the dance practiced in the courts of the Angkorian monarchs, which in turn drew its inspiration from the mythological court of the gods and from its celestial dancers, the Apsaras. Apsaras were also an important motif in the art of Champa, medieval Angkor's neighbor to the east along the coast of what is now central Vietnam. Especially noteworthy are the depictions of apsaras in the Tra Kieu Style of Cham art, a style which flourished in the tenth and eleventh centuries C.E. ↑ Rig Veda, Book X, Hymn 95. ↑ Mahabharata, Book III: Vana Parva, Section 43. ↑ Mahabharata, Book I: Adi Parva, Section 71-72. ↑ Maurice Glaize, Monuments of the Angkor Group, 37. Banerjee, P.Apsaras in Indian Dance. Cosmo, 2003. ISBN 978-8170200604. Maurice Glaize. Maurice. Monuments of the Angkor Group. J. Maisonneuve, 1993. ISBN 978-2720010910. Marchal, Sappho. Khmer Costumes and Ornaments of the Devatas of Angkor Wat. Orchid Press, 2006. ISBN 978-9745240575. The Rig Veda in the English translation prepared by Ralph T.H. Griffith is available online at sacred-texts.com. The Mahabharata in the English translation prepared by Kisari Mohan Ganguli is available online at sacred-texts.com. The Monuments of the Angkor Group by Maurice Glaize is available online in English translation. This page was last modified on 9 April 2016, at 16:25.